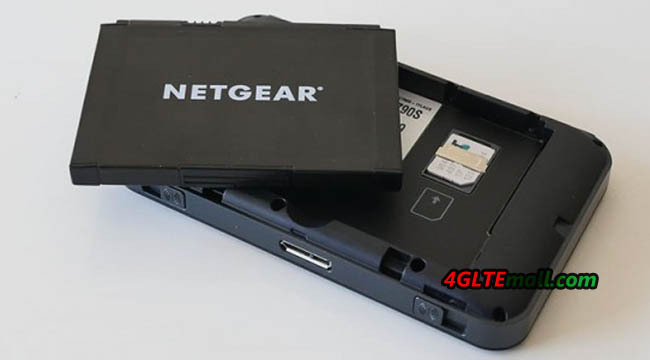 Netgear Aircard 4G mobile hotspots are one series of most popular 4G pocket routers. From the gain of Sierra Wireless, Netgear followed the appearance of the aircards but improved much on the functions and performance. In the aircard family, there are Aircard AC754S, AC770S, AC771S, AC779S, AC778S, AC762S, AC760S, AC763S for LTE Category 3. 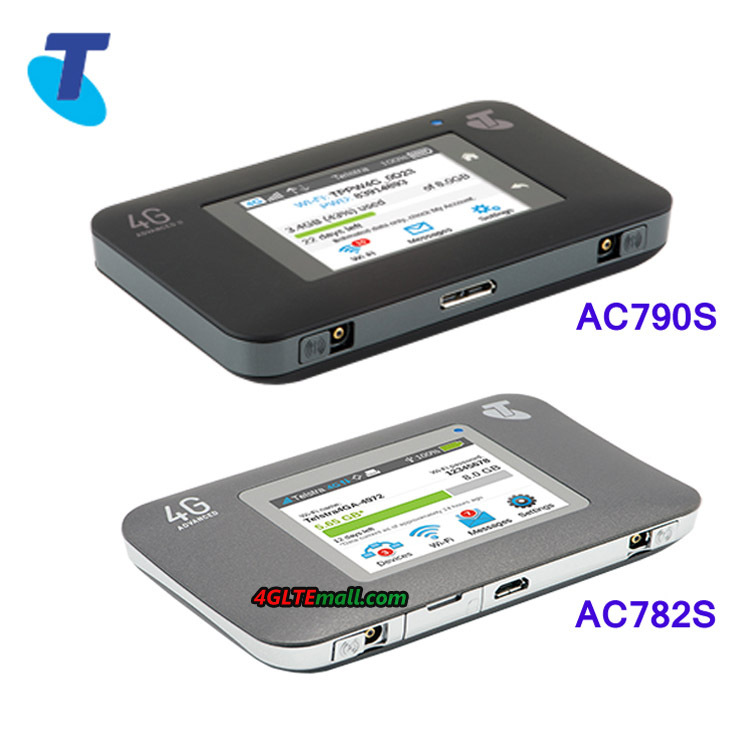 Now the LTE Category 4 mobile hotspot includes Netgear AC781S, AC782S, AC785S. What amazing is that the Netgear had presented the LTE Category 6 mobile hotspots to public. Many customers are already using the new LTE Cat6 router. The model number is Netgear Aircard 790s. 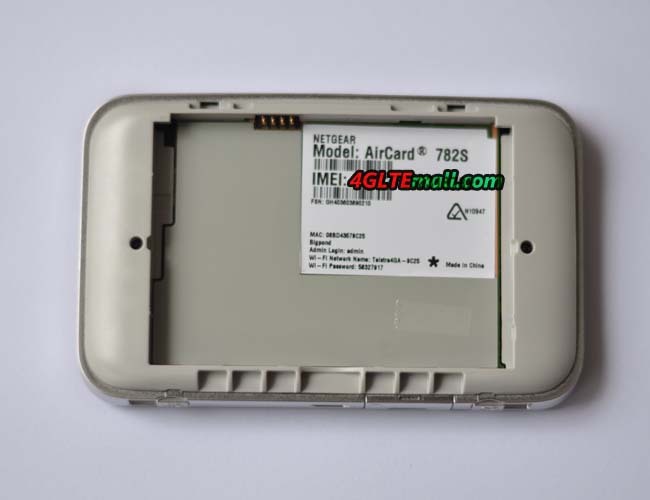 If you had used the Aircard 782S, you may found the two 4G mobile hotspot looks very similar. It’s the first impression at a glance. They are both introduced by Australian network provider Telstra. 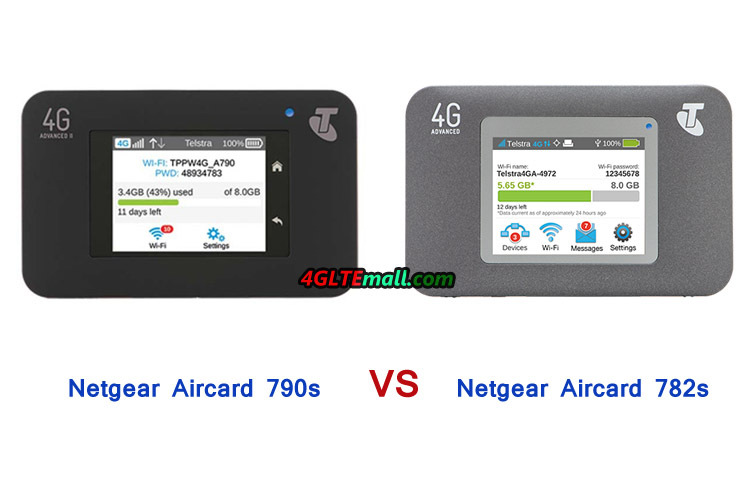 The Netgear AC782S is also named Telstra 4G WiFi Advanced while the Aircard 790s is named Telstra 4G WiFi Advanced II. As two generation mobile 4G Router for Telstra, we will have a look at what’s the difference between the two models. Appearance Even though the Aircard 790s and 782s look similar, there are obvious model named printed on the device. The 4G Advanced is on the 782s and 4G Advanced II on the 790s. The Telstra logo is at right top side. The body color of 782s is in grey. The body color of Netgear AC790s is darker than 782s, it’s in black color. The thickness of the two models are very similar to 15mm. On the front center, there are 2.4 inch QVGA capacitive LCD screen, where user can operate the settings and read information about the network status, providers, WiFi name and password, battery status etc. The power buttons are at the top edge of the body. The USB port and two antenna connectors for external antenna are at the bottom edge. If one user is located at areas with poor signal, external antennas may be necessary to get better surfing experience. Both the AC782S and AC790s has removable battery. The AC782S has battery of 2500mAh while AC790S has battery of 2930mAh. Based on Qualcomm Qualcomm MDM9225 & WTR1605L chipset, Aircard 782s could support 4G LTE Band 1/3/7/8 and the peak download speed up to 150mbps. The Aircard 790s is on Qualcomm MDM9230, it could support multiple LTE bands 1/3/7/8/28 with peak download speed to 300Mbps, which is double speed than Aircard 782s. They are both back compatible with qual-bands UMTS/WCDMA networks, and GSM/EDGE network is also supported. As a 4G mobile router, Netgear 782s could support up to 10 wireless terminals simultaneously. The Aircard 790s is more powerful on this function, up to 15 wireless users could be connected at the same time. Aircard 790s supports WLAN 802.11 ac which is missed in 782S. But dual-band WiFi and 2 X 2 MIMO are both available on the two mobile routers. And they both use Micro SIM(3FF Format). Operation The two mobile hotspots could both be easily operated via the LCD screen. User could choose network mode, do the factory reset, update software by clicking the screen. If user want to do more settings, it can be done via web browser or via the Netgear management APP. There is no doubt that the Aircard 790s is in higher price than 782s because AC79S is in higher specifications and better performance. For most users, the Netgear Aircard 782s is enough for common use on daily life, but if you want to surf in amazing speed, Netgear Aircard 790s would be better. But first of all, user must make sure the LTE category 6 carrier aggregation is already available at your location.